While we're still waiting for BeOn's long-promised support for a connected home standard, this new product is a welcome addition to its product line. When we reviewed BeOn’s Home Protection System last December, we complemented BeOn for its ingenuity and ease of use, but lamented the bulb system’s lack of support for any of the major smart-home systems The company said such support was in the works, but it’s been nearly a year and we’re still waiting. The BeOn smart LED bulbs don’t change colors and they can’t be integrated into another home-control system, but they offers some terrific security and safety features that no other bulbs can match. BeOn has improved the user experience with its bulbs in one other way: They’ve introduced a new two-button key fob that reduces reliance on the company’s mobile app. While you still can’t control individual lights with it, you can quickly toggle between home and away modes with the push of a button. That’s a whole lot faster than whipping out your smart phone and waiting for the BeOn app to launch. The fob is reasonably priced at $30, and it’s very easy to incorporate into the BeOn system. Launch the app on your mobile device, select Add New, and then select Add Key Fob. The next step is to press the fob’s Home button. It took about 30 seconds for the app to recognize the fob and acknowledge that it had been added. The app walks you through every step of the setup process. Much of the BeOn system’s appeal is that it learns your lighting-usage patterns and then replays those sequences while you’re gone, giving any would-be burglar the impression that someone is at home. An occupied home is far less likely to be broken into. So before you start using BeOn’s key fob, be sure you have your Home and Away settings programmed the way you want them; the Away function won’t work properly if you don’t. Pressing the Away button activates the function where it plays back your lighting usage patterns, so it needs something to work with. If you’ve just installed your BeOn system, it will take a week or two before the key fob’s Away function will work optimally. Using the key fob is also pretty simple—as you might expect since there’s only two buttons. As we’ve already discussed, pressing the Away activates the security function (you’ll know it’s active when the bulbs flash three times). Pressing Home turns all the lights on and at full brightness—there’s no way to get around that. On the upside, you could turn on all your BeOn bulbs when you arrive home and before you enter the house, instead of waiting to go inside and tap a switch or reach for a lamp. Once inside your now-illuminated home, you can turn on whichever other light you want and then hold the fob down for three seconds to turn all the BeOn bulbs off. Another useful scenario would be if you hear a bump in the night and want to turn on several lights all at once for added security. There’s not much else the fob—or the BeOn system as a whole—can do. You can’t program the fob to turn on just one or a couple of lights, and the fob—unlike the app—doesn’t restore the bulbs to whatever level or brightness they were programmed by the app to operate at. That’s annoying. 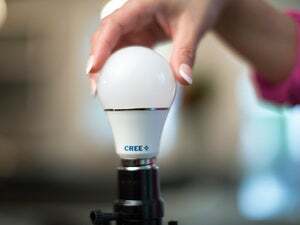 BeOn has promised since launch that it was looking to incorporate its BeOn bulbs into broader smart-home systems. They even had an exhibit inside the Z-Wave Alliance’s booth during CES 2016. A removable battery pack that can change the bulb’s functionality is one of the BeOn bulb's best features. BeOn could conceivably offer a version with a Z-Wave or ZigBee radio in there and offer it as an upgrade. If you already own a BeOn system, the key fob is a very good addition. But it’s not enough for us to issue a strong buy recommendation for new buyers. BeOn's key fob is much more useful than its app for turning the BeOn bulbs on, but you it turns all the lights on or off, and only at full brightness when it turns them on.